CHARLOTTE, N.C. (AP) Nashville Fairgrounds Speedway will not be part of next year's NASCAR schedule, so come to terms with that now. This can only happen in 2020 if track operators agreed to host a midweek event, and many have argued that giving up a Sunday date will harm their bottom line because they will lose campers. But the schedule as is - 38 events from February to November - is far too long and untenable as NASCAR bids to rebuild the fan base. 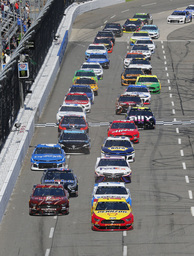 Teams want a break and a chance to take their own summer vacations, and drivers have been among the loudest in asking for midweek events. It's not impossible for a double-header with IndyCar - and it's a smart move for the exposure it would bring to both series - but realistically that's a long-range hope and not something that can be pulled off next year.